This is a huge opportunity to join in an area of expansion for our client. 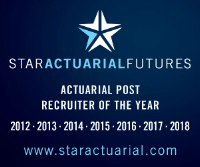 Ideally, you are a new business pricing actuary with a strong understanding of longevity/mortality pricing tables or you are a longevity risk specialist with a focus on the academic side. You must have at least 4-5 years of experience as a nearly/newly qualified actuary (more experience is of course welcome).